It was a 1937 Chevy Coupe. Rust has taken over its once gorgeous steel body. The front buckets seats are missing and the back seats are stained and torn. 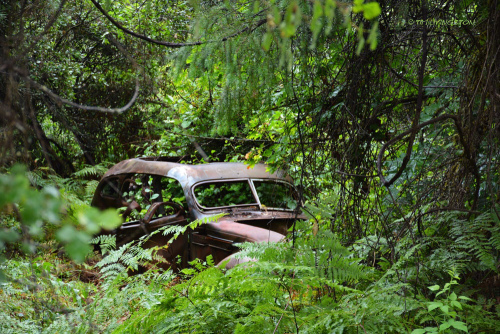 Most of the instruments of the dashboard are gone; the engine had been picked through; for some, it was a place to bring the ladies since it was deep in the woods, hidden and out of the way; off the beaten track they’d say. You and your lady could scream, yell, and do whatever and know one would know. That’s why old Bugsy’s hideout was nearby. After a shootout with the police in ’42, he drove it here and ran off – never to be found again – you can see the bullet holes in the trunk. Makes me wonder how many guys he stuffed in that trunk at once during his reign of terror. Two? Three? Five? I bet I have him beat. So far, during my reign, there are eight ladies tucked in there. Once the decomposition kicks in, I can probably add a couple more. A PLACE FOR THE LADIES is my submission to the weekly writing challenge by Flash Fiction for Aspiring Writers (https://flashfictionforaspiringwriters.wordpress.com/2017/03/13/fffaw-challenge-week-of-march-14-2017/). This week’s photo prompt was provided by Tim Livingston with the blog, The ForesterArtist. Thank you! The goal: 75 to 175 word count. This stories word count: 175 words. Copyright © 2017 E.F. Olsson. All rights reserved. Let me know what you think of this story in the comments below. If you like it, please share it with your friends on your favorite social media sites. And while you’re on those social media sites make sure that you follow me on Facebook, Twitter, Instagram, and Pinterest! You can always get in touch with me by leaving a comment below or by email: EFOlssonAuthor@gmail.com. Chilling! Great horror story E.F! Sounds just like a creepy serial killer. Delightfully creepy. Wonder if they’ll ever catch on to him? Creepy… wouldn’t wantbto be one of the ladies invited there.